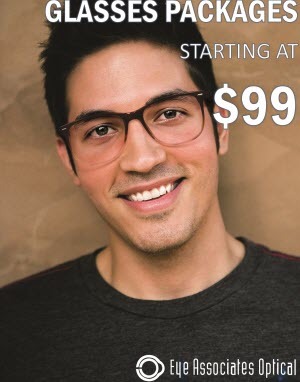 Design the right eyewear for your needs! Reduces glare by reflecting light off the lens surface. This treatment is especially helpful when driving after dark and helps reduce eye fatigue while working on a computer. Darken in bright sun, providing a superior visual experience and offering a distinct advantage over ordinary clear lenses. Provide continuous vision, with one pair of glasses, from distance to near. Provide a filter to eliminate the glare from reflective surfaces. These lenses can be worn indoors by light-sensitive individuals and are great options for those who fish, play golf or seek a better driving experience. Patients with eye conditions such as cataracts and age related macular degeneration also benefit from these lenses. Are comprised of a dense material, resulting in thinner, lighter lenses than plastic. Maximizes visual acuity by providing precise, personalized lenses with a more accurate correction. Wearers will notice more relaxed, stable vision especially when using modern technologies such as tablets and smart phones. *We accept many vision insurance plans, which may affect promotions.